But is it really so simple? Where’s the bread? How do you “spread”? How do you put the two pieces of bread together? You and I know how to do these things, but try telling a computer how to make a sandwich! When you write an algorithm for a computer, you have to be very specific, and you have to speak the computer’s language. You do this by using a programming language. Here’s an algorithm that creates a mathematical object called a fractal. Try this one on paper. Notice how step 6 says “Repeat”? In computer programming, this is called a loop. What happens if you repeat the loop in this algorithm 10 times? What about 50 times? 200 times? OK, so maybe you were patient enough to draw 200 dots. Congratulations! 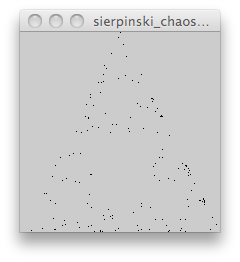 You’ve probably begun to see the fractal known as the Sierpinski triangle! What if you wanted to see this fractal with 1,000 dots? Or 10,000? You probably wouldn’t want to draw all of those dots by hand. This is a great time to use the computer, which is really good at repeating simple things like this algorithm! There are many different programming languages out there. A great one to start with is called Processing, because it runs on any kind of computer, is free, and is easy to learn. Go to http://processing.org to download it. Then copy and paste in the program below, and hit the play button! Your ability to easy explanation is amazing. This is one of the best tutorial I have ever read, looking at the construction.